*All delivery times above are based on average in-transit time. Orders cannot be shipped to P.O. Boxes. As soon as your order ships, you will be provided with a tracking number via email. You can also find your order details and tracking information on the Order History tab within the My Account section. 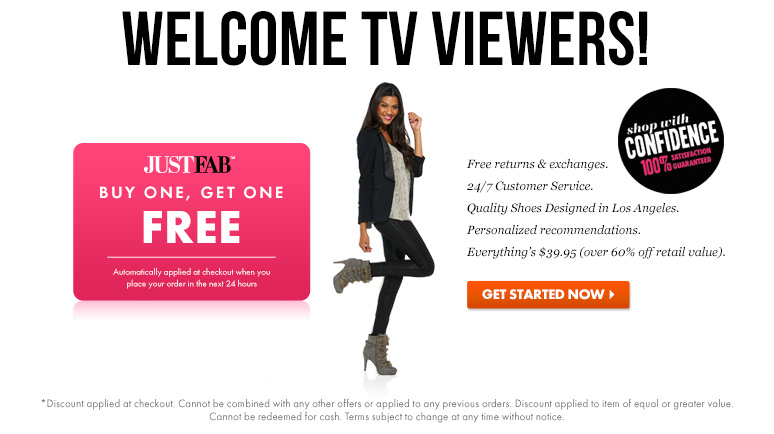 JustFab strives to provide an amazing shopping experience and superior customer service. If for any reason you are not content with your order, we gladly accept returns and exchanges within 30 days from the date of shipment and in new, unused condition with original packaging. Some items purchased through special promotions may be final sale, and therefore not eligible for exchanges or returns (please refer to promotion disclaimers for the terms of each offer). Call our Member Services Team 24/7 at (866) 337-0906 to get your RMA return number. Write this down on a piece of plain paper to be included in your return package. Place the paper with your RMA return number, plus return item(s) with original packaging and all required accessories (shoebox, tissue paper, etc.) in a protective shipping box. Secure your box and take it to your nearest US mail location for shipping. Please note that any membership or store credit used to pay for an order will be returned as store credit and will not be eligible for a refund to a credit card.